We’ve finally arrived at the last multi-game slate of the NFL season and it’s coming with some challenges. The salaries on DraftKings are really nice on each player, and I don’t think salary is going to be a massive issue. You can’t technically play everyone that you would want but there’s also really not a player that is going to break your budget. That’s a blessing and a curse because there’s likely not a ton of room for error. The biggest decision you probably need to make is how heavy you want to be in the first game with potentially very cold weather. For me, I’m not overly concerned about it at this point and neither is Vegas. Both games are tight spreads and within 1.5 points on the over/under. Let’s go to work, RC Premium Members! *Talib's absence did coincide with a tougher schedule, but LAR still allowed 8.3 YPA, 17/3 TD/INT w/o Talib if you remove the KC game where Mahomes threw for 478-6-3. Do I think Talib is the difference between stifling Brees or not? Honestly, probably not. 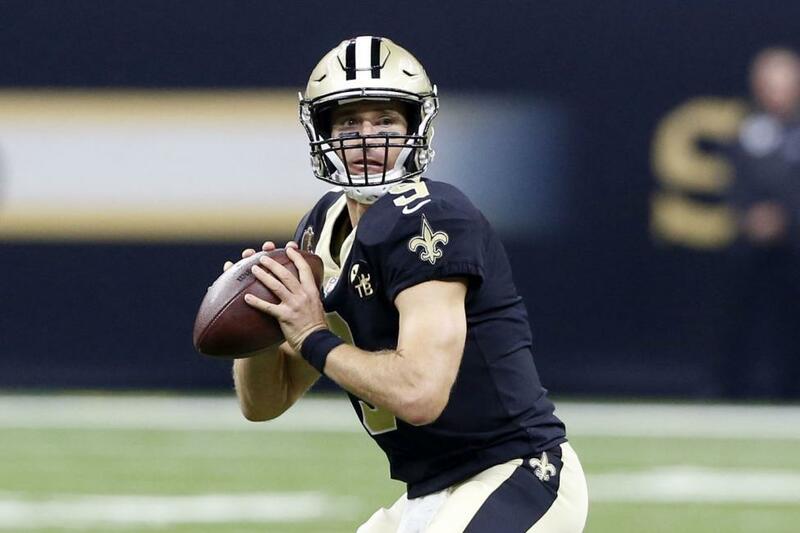 My main concern with Brees is the New Orleans offense has so many ways to get it done, and they continue to be infatuated with Taysom Hill. He may not get a ton of touches but he gets enough to tilt you. Even last week, he had a touchdown called back via penalty. Brees has some risk but also could have the highest upside on the slate. On the other side, Jared Goff gets in improved New Orleans secondary. Eli Apple has a bad reputation but his stats are better than one might think. He’s only allowing a passer rating of 76.7 this year so between that and the crowd, the path isn’t easy for Goff. He helped light up the scoreboard in the first meeting with almost 400 yards passing. While he’s the cheapest and might be chalky, I think both quarterbacks probably don’t achieve the heights of the first meeting. Running Back – Can the Saints excellent run defense stop the best running back in the NFL right now and his sidekick, Todd Gurley? I know, that joke is stolen from about 2,284,384 people but it’s still funny to me and I’m using it. I don’t think people realized that C.J. Anderson is actually a decent back. He ran for over 1,000 yards last year in Denver and in this system, I’m not surprised he’s doing well. What did surprise me was the amount of snaps and touches he got last week. Gurley got the majority of snaps but Anderson got the advantage in touches, 23-18. That’s not ideal for either player’s fantasy value against the number two rushing defense on the season. Between the tough matchup, workload split and the fact that Gurley is the most expensive back by $1,000 on DK, I think he could be the odd man out as we sit today, as is Anderson. The Saints have their own committee going but it’s a little bit clearer what the goal is there and that’s to give Alvin Kamara the bulk of the work. Kamara out-touched Ingram by a basically 2-1 ratio last week and there’s little doubt who’s the most talented or multi-faceted. The Saint should be hitching their wagon to Kamara and going as far as he’ll take them, The one knock against Kamara is the Rams allowed the 20th fewest receptions to running backs. That would be a big blow to his game but it doesn’t really do much to help bump Ingram up. I think Kamara is in the running for a flex spot and Ingram is a GPP play that will be low-owed you hope scores a touchdown. Wide Receiver – This game is loaded with options on the fast track and if I think there is one spot where a position group has an advantage as a whole, it almost has to be in this one. The Rams boast both Brandin Cooks and Robert Woods, both of who would make a nice double stack this week. Woods will see a lot of P.J. Williams in the slot, which usually bodes well for receivers and Cooks always runs better on turf. What’s interesting is the Saints do have corners that can run. Apple ran a 4.4 40 yard dash and Marshon Lattimore ran a 4.3. That is typically something that gives me pause with Cooks but with the loss of Cooper Kupp around the middle of the season, Los Angles has need both Cooks and Woods even more. Josh Reynolds continues to be a roller coaster, with just four targets last week. On a slate that features Gurley, Travis Kelce, Tyreek Hill and Kamara, Michael Thomas takes the top slot as far as salary goes. It’s certainly hard to argue that he should be anything but as he led the NFL in receptions this season and finishing sixth in yardage. Oh, did I mention he walked the Eagles secondary all over the field last week to the tune of 38+ DK points? Aqib Talib has obviously made a difference in the performance of the defense but he has not traveled this year, spending 89.9 percent of his snaps at left cornerback. Thomas runs 69.1 percent of his routes away from that side of the field so unless the Rams break their normal defense, Thomas could be the highest scoring player on the slate this week. I also think Ted Ginn is perfectly viable coming off seven targets last week, one of which could have been a long touchdown if not for a bad under throw from Brees. The ownership might be a little lower seeing as how Ginn didn’t do much of note. I’m not one to take fliers on Kieth Kirkwood or any other receiver this week. Tight End – It’s realistically going to be pretty hard to not just eat the Kelce chalk this week. Gerald Everett goose egged everyone last week while Tyler Higbee provided just five points. Neither are ever going to be a focal point and the Saints play well against the position. New Orleans doesn’t have a lot to boast either, as Ben Watson led their crew with red zone targets with eight. He missed another practice, so it’s possible Josh Hill or even Dan Arnold could emerge but would be deep GPP only. D/ST – Well, good luck with this position this week. The four finalists finished as the 1, 2, 3 and 4 in points per game. To say that’s not optimal is an understatement. If I have to pick on from here, I would go the Saints just due to home field advantage. All four teams finished in the top seven of turnover differential so there’s not a ton of opportunity there. Quarterback – The new kid on the block that looks poised to smash records for years to come versus the old goat. This matchup should be a lot of fun and it definitely featured a ton of points the first time around. Tom Brady runs somewhat the same concerns as Brees. He could throw for 400 yards and three touchdowns, he could throw for under 200 and zero touchdowns. It just depends on what New England chooses to do in a particular week. He threw the ball 44 times last week but barely clipped 20 DK because Sony Michel was the touchdown master. I think the game plan will be similar in that the numbers skew pass but the running game could be key to scoring. Patrick Mahomes comes off a nice performance in his first postseason game, but was a disappointment last week to be sure. I think they need him a little bit more this week, so the choice becomes do I want to use Mahomes at the high cost to attack a team that gave up the 11th most passing yards on the season and well over 300 to the Chargers last week(garbage time still counts)? I think other quarterbacks can score close to Mahomes if they all hit upside numbers, but he is still the number one choice if you can afford him. Running Back – You can make a very strong argument to just ride the pair of James White and Sony Michel again this week. The two combined for 40 touches last week and I’m not sure why New England will change things this week. Michel ran all over the Chiefs the first meeting and Kansas City finished sixth worst against the run. The Chiefs also gave up the third most rushing score on the year so this isn’t really a spot that you’re point chasing. With White, the receiving corps is pretty desolate for the Pats. 31 of the 44 pass attempts for Brady last week went to White, Julian Edelman or Michel. White should be heavily involved and the Chiefs gave up the 10th most receptions to the position. Maybe this is a stretch, but I think one of the locks of the stretch is Damien Williams. Talk about taking a job and literally running with it, Williams has been a revelation in the Kansas City backfield. He saw 30 touches last week and is a key component in this offense. There is no way that Spencer Ware comes back to dip into the workload too heavily and the one of the ways the Chiefs run the ball is exactly the style that New England struggles with. Chargers didn't even try to attack the weakness of the Pats run defense. Melvin Gordon had just 4 carries all game from 11 personnel. Unsurprising, really, since they don't invest in analytics. If the trends hold, Williams is about to have a massive game and is still just the third most expensive back. If the weather does have an effect and helps ground the passing game, all the better for Williams. I can basically promise you I’m not fading him this week, and maybe myself and Brian Healy are on the same page with that again this week. Wide Receiver – The only Patriots receiver I want to have a big piece of is Julian Edelman. He’s just been a magnet for targets, like any other time in his career and will continue to be the focal point of the passing game. He saw a monster 13 targets last week and smashed his price tag. His style of game is not likely to be impacted by the weather at all and they need him in a big way. Chris Hogan and Phillip Dorsett just aren’t going to be anything you can trust this week, even though Dorsett caught a very tilting touchdown pass. I faded Tyreek Hill a lot last week, to almost disastrous results. I feel somewhat justified for the process, because 9.6 points came off a touchdown run but that’s how explosive a player he is. Cold or not, the man is still faster than a jungle cat out there and with the ball in his hands he is lethal. He put up his third highest score of the season in the first meeting and it would be unwise to not have a piece, but I still tend to favor Thomas in that price range. Sammy Watkins is really a great salary saver and just a solid play. The attention will be on other players and Watkins played 93 percent of the snaps last week. I’d say the foot is fine and eight targets is fantastic. Tight End – Eat the chalk. Kelce would likely be one of the highest owned players on the slate just due to lack of alternatives. He’s been a wide receiver at a (albeit expensive) tight end price point and is the exact same way again. No other tight end on the slate is all that likely to score half of what Kelce does unless he has just a flat out awful game, including Rob Gronkowski. He’s played 14 game this season and exactly five of them have gone for double digit DK points. Last week, he saw a whopping one target since he was so excellent at blocking for the run game. If I lose because Gronkowski goes vintage Gronk, I’ll just have to chalk up the loss. D/ST – I just don’t want to play a defense against Patrick Mahomes and company at home. The downside is legitimately negative points given the offensive prowess. About the only way the Pats turn out to be viable is if they get a return touchdown, which is always in play with Cordarrelle Patterson as the return man. $2,100 isn’t much but it’s still risky. I’m likely going with the Chiefs as my defense of choice. Picking on Brady in the playoffs isn’t typically the smartest thing ever but KC did tie for the league lead in sacks. One thing we know turns Brady into a mortal human is pressure, so if the Chiefs can harass him they can get a few points. None of the defenses look that great on paper.